The Eon is built on a completely new platform and to say that the Eon is good looking would be an understatement. Of late Hyundai has adopted their ‘Fluid’ design philosophy and we have seen the results of that on theVerna and the next generation Sonata and Elantra will carry the same design theme. The Eon too uses the same Fluidic design philosophy with the characteristic hexagonal face and the swept back headlamps. The elaborately designed headlamps, massive wheel arches, creases on the bonnet and the triangular fog lamps look cool. All these elements also add visual bulk to the design of this small hatch and this car is sure to appeal to a broad cross-section of people. At the side the shoulder line is prominent and it swoops up along the rear window. At the rear are the massive comma-shaped tail lamps and an integrated rear spoiler which carries on the overall funky look. The rear wind screen in large and the shut lines around the hatch are tight. 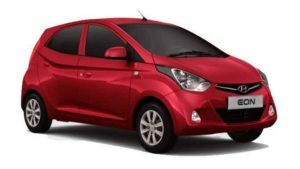 Hyundai Eon Price in Kolkata Hyundai wants its customer to think of the Eon as a modern car which carries a small tag and overall the appearance is swanky it is really hard to think of the Eon as a budget hatchback.